Tucson native, Frank Fregoso, started working in broadcasting for Radio Station KXEW while in high school and became Assistant Engineer of the station after graduation. Frank was then given the opportunity to become Chief Engineer with one catch - he had to get his FCC First Class License. Frank went on to receive his license and became Chief Engineer of his first station at age 21. Frank was later hired by KRQQ and KNST in 1981 and worked for the stations for almost 12 years. During this time Frank continued to also freelance for a few stations in town such as KXEW, KQTL and KTUC which then became his fulltime job. 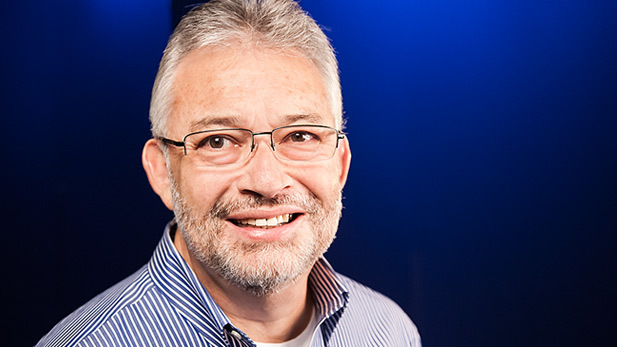 Frank Fregoso joined Arizona Public Media in 1996 as the Transmitter Engineer for AZPM on Mt. Bigelow. A few years later Frank was asked to help maintain the broadcast facilities for both radio stations and shortly thereafter became Chief Engineer of Radio and Assistant Chief of Television. In 2007, Frank became Chief Engineer of Arizona Public Media. Frank enjoys music and was a member of the AZ Opera Company Choir while in high school. He was a member of St. Philip’s In The Hills Church, Canterbury Choir for many years and most recently has sung with Reveille Men's Chorus. His biggest love is the pipe organ and some day he hopes to build and play his own pipe organ at home.